[vc_row][vc_column][vc_column_text]In the past couple of years, smartwatches such as those made by Pebble and Sony had very limited functionality, battery life and technical specifications. Even Project Glass was seen as a revolutionary technology, when it was announced back in 2012. This had indicated wearable computing to the next level. Google Glass allowed its users to view the information they needed in the corner of their eye, which gave them instant access to the World Wide Web with just a simple voice command. Billed as a more modernistic, contemporary smartwatch than the other such ones we’ve seen before, the Moto 360 will be out in the market this summer. This stylish, wearable device has an iconic design, featuring a round face and premium material, which feels comfortable and familiar on your wrist. You can have the ideal look that you desire, as the device has been designed with a fashion-savvy crowd in mind. The device will convince people to give up their classic wristwatches to join the wearable industry. There are a number of key features that have been announced. Fitness is without a doubt a key component of this device. Google representatives say that the user will be able to get “real-time speed, distance, and information on your wrist for your walk, cycle or run.” This means that Google Maps will be built in so that you’ll directly be able to get directions from your wrist. Through the watch, you will also be able to see the time when you glance down at your wrist. In some smartwatches, the screens turn off when they’re not in use, meaning you’ll need to wake up the screen to see the time. With the Moto 360, things won’t be this way. 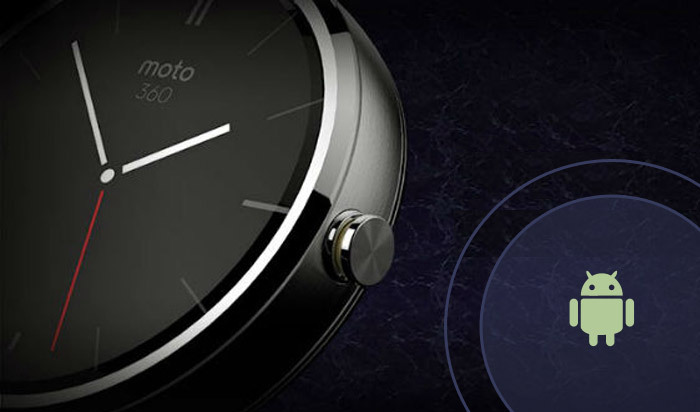 For Android fans, this is good news for those eyeing the round Motorola smartwatch, while it’s not good for iPhone users who hoped to get their hands on the Moto 360. When it comes to Android Wear, the first thing we notice about this platform is that it may appear to be similar to Glassware, but it’s a much more practical form factor. This would mean result in more users and more potential for success of any certain app. The apps will also be designed to run smoothly on a number of devices, and is not just Motorola’s upcoming offering. Google is entering the vast library of existing Android apps, instead of building a new set of smartwatch apps. They are only pulling out the parts would be perfect for such devices that is, voice control and actionable notifications. It’s a real no-brainer to develop on a multi-device platform, when compared to developing for a single device on a different framework. A watch that could only focus on Google Now might be dull and useless for most people.